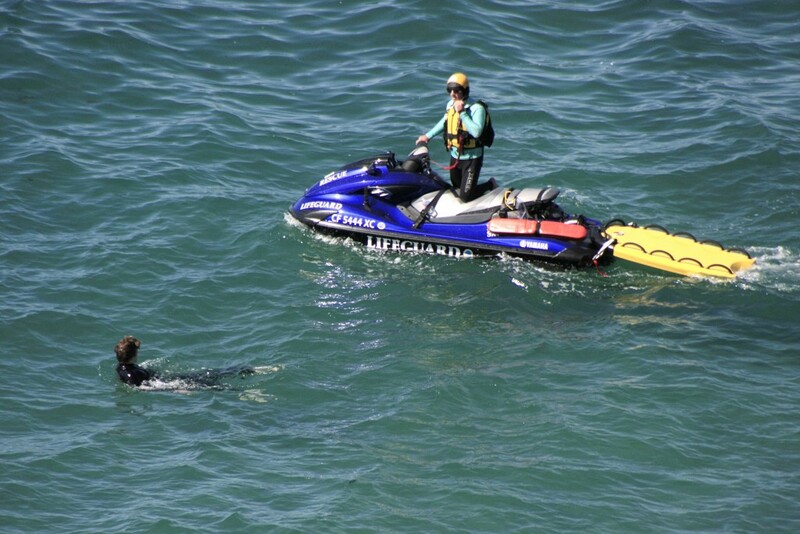 Disaster struck about 300 yards off the shore of Corona del Mar State Beach on Wednesday. A distress call came in that two boats collided and both were taking on water. 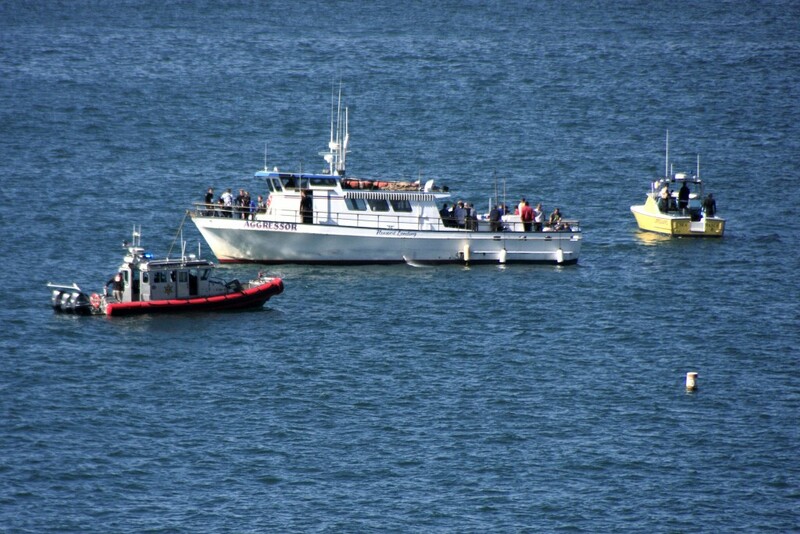 The Aggressor, the 65-foot vessel from Newport Landing, radioed in that they had collided with a fishing boat. People were already overboard and the other boat, a 35-foot cabin cruiser, was sinking. 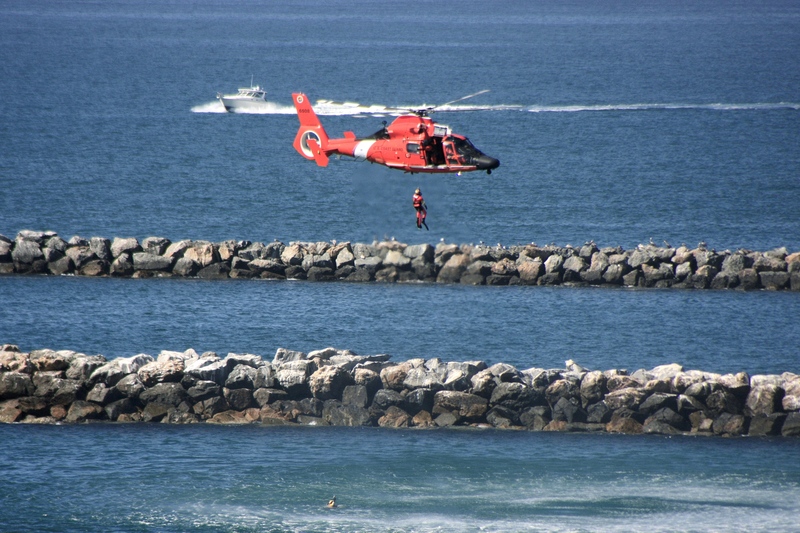 A U.S, Coast Guard helicopter makes a rescue off the jetty near Corona del Mar State Beach during the maritime disaster drill on Wednesday. Luckily, this was just a test of the land, sea, and air response and rescue operations in a simulated maritime disaster exercise. 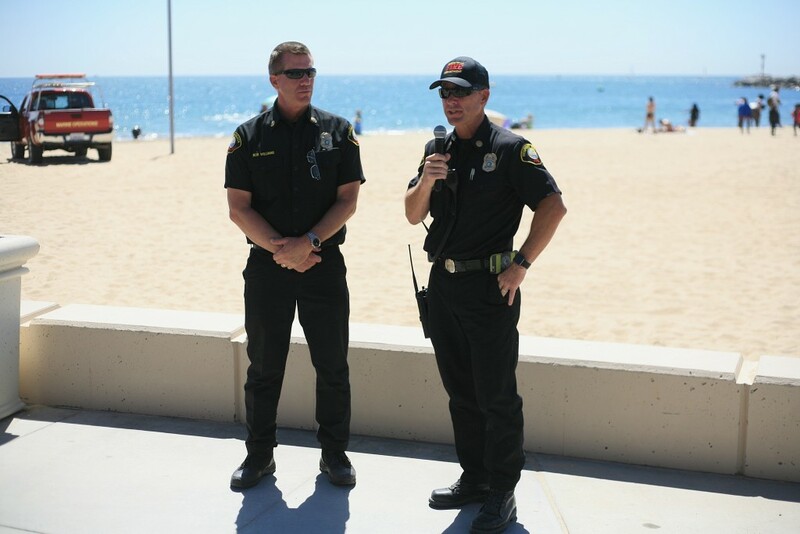 “We wanted to test drive all of our policies, procedures and systems and see if there were any weaknesses,” said Newport Beach Fire Department Assistant Chief Chip Duncan. 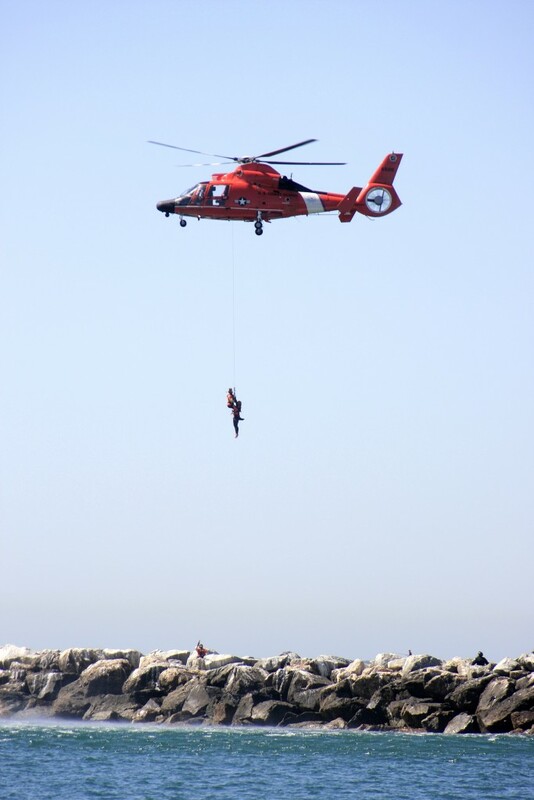 More than 200 public safety and public agency personnel, local media professionals and community volunteers joined NBFD from U.S. Coast Guard, State of California, Orange County Sheriff‘s Department Harbor Patrol, Orange County Fire Authority and personnel from 12 other OC cities. The exercise was funded by a $89,000 federal grant the city received from the Urban Areas Security Initiative. It’s been two years in the working, Duncan explained, who helped organize the drill along with NBFD Assistant Chiefs Rob Williams. Santa Ana Police Department Sgt. Brad Hadley also helped make it happen. 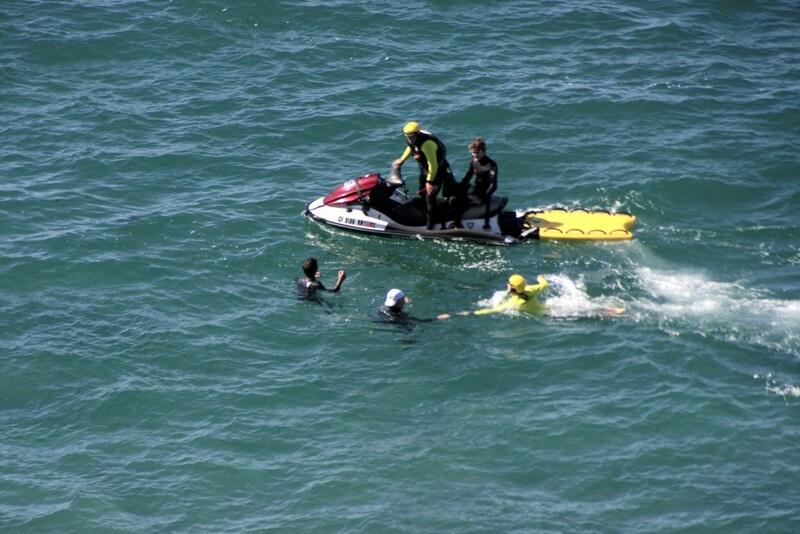 “The plan you start with is not the plan you end up with when you hit the beach,” Duncan said. Everything seemed to go smoothly, Duncan noted. There were a few hurdles, some of the group leaders noted during the hot wash debriefing, including noise or delay with radio frequencies. But overall, it went well, they agreed. The first “victims” of the mock disaster are treated by Newport Beach lifeguards. An After Action Report will be put together by April. 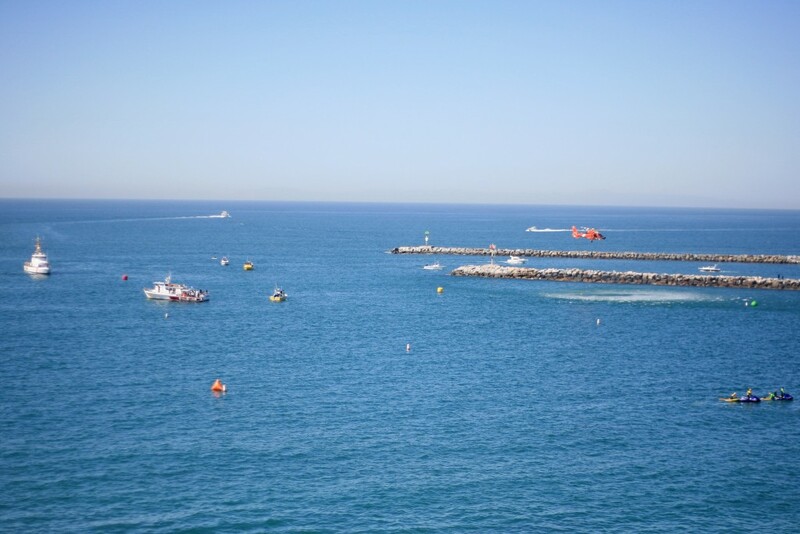 It’s been two decades since a maritime disaster drill of this magnitude has been conducted in Orange County. In an incident with this many victims, it’s important to start organizing on-site as soon as possible, NBFD Fire Captain Justin Carr noted. An emergency of this scale would overwhelm the initial system, Carr explained. Local authorities would need to call agencies from all over Orange County to help respond. 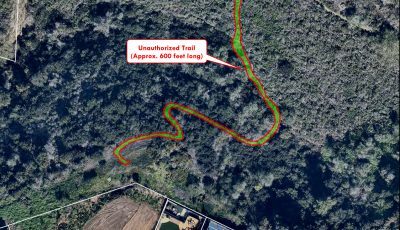 “The intent is to coordinate efforts (between agencies) to make sure we have the best outcome for the most amount of people as quickly as possible and as efficiently as possible,” Carr said. If this were to happen for real, the drill would hopefully help things go smoothly, he added. 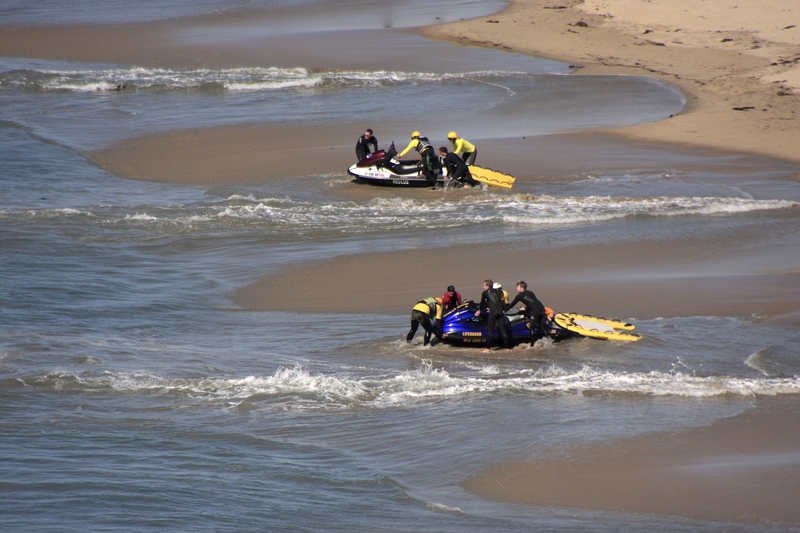 Lifeguards on personal watercraft rush to the aid of “victims” in the water during the drill. They pulled from all over the county for the exercise, Duncan said. Some of the agencies work together on a fairly regular basis, explained Orange County Sheriff’s Department Harbor Patrol Lt. Mark Alsobrook, but generally only the organizations that share a border or coverage areas, and usually only a few at a time. It takes a large scale event to bring together agencies from all over the county all at once. 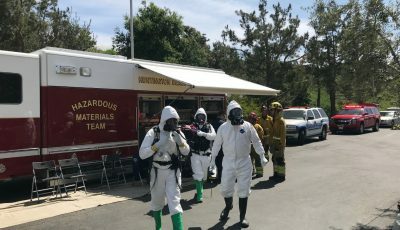 “I’m standing shoulder to shoulder… with (several) agencies, coordinating all our efforts,” Alsobrook noted. Mayor Diane Dixon was also on hand as an observer. 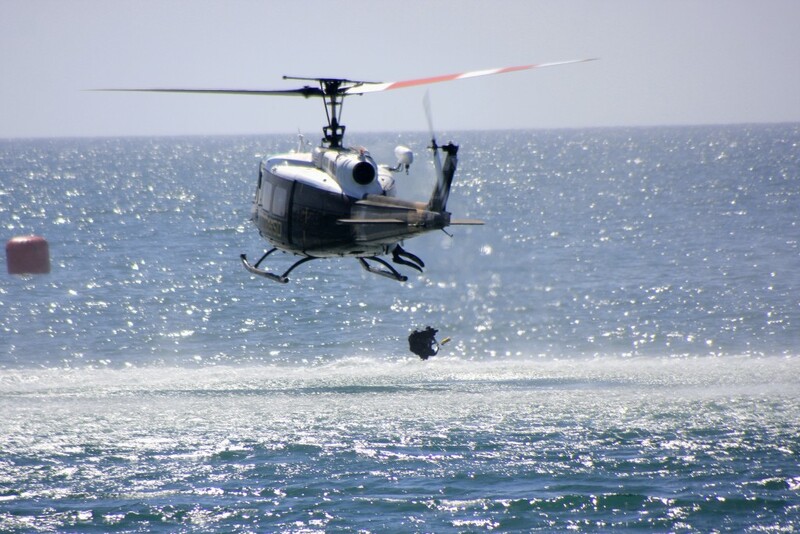 She was impressed with how the multiple agencies showed that they are highly trained, skilled and capable. “Some of the best plans on the shelf are only that until they’re tested in real life, so a real drill is extremely helpful to identify if all those paper plans really work,” Dixon said. It’s best to be prepared in case of a real disaster. 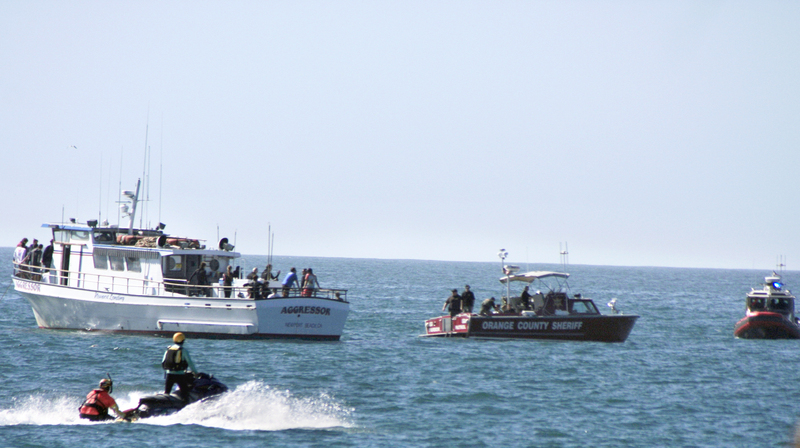 Responding agencies rush to the scene of the disaster scenario, surrounding the boat that made the distress call, the Aggressor. 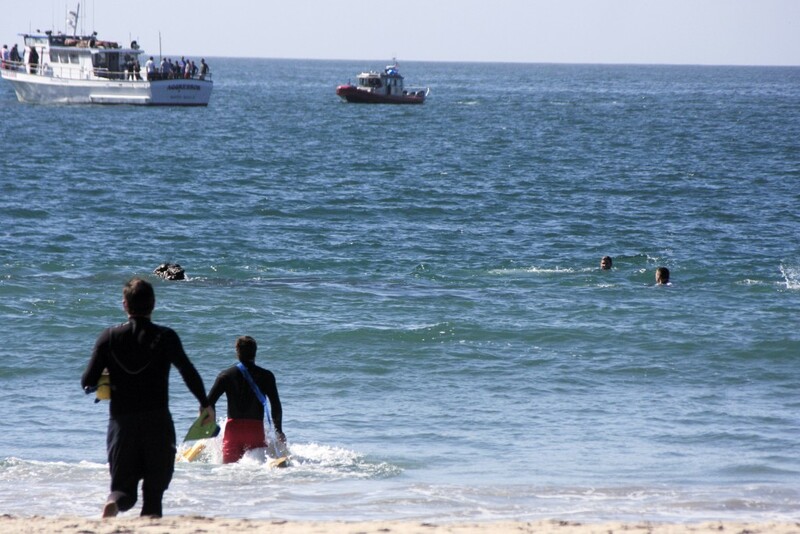 Newport Beach lifeguards rush into the water to help the first “victims” out of mock disaster. A U.S. Coast Guard rescue diver and “victim” are pulled up to the helicopter as another “victim” waits in the water. Newport Beach lifeguards help the first “victims” out of the water. Lifeguards prepare personal watercraft to assist with the rescue operations. 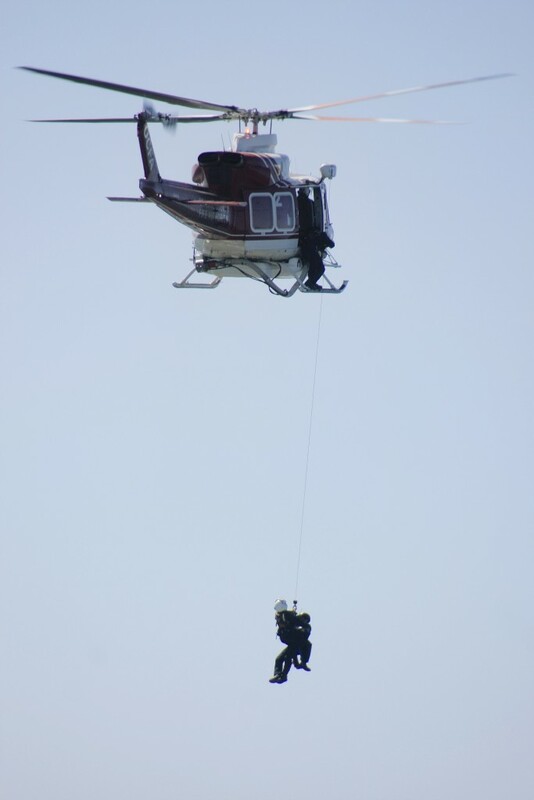 A diver drops from the Orange County Harbor Patrol helicopter during the disaster drill. 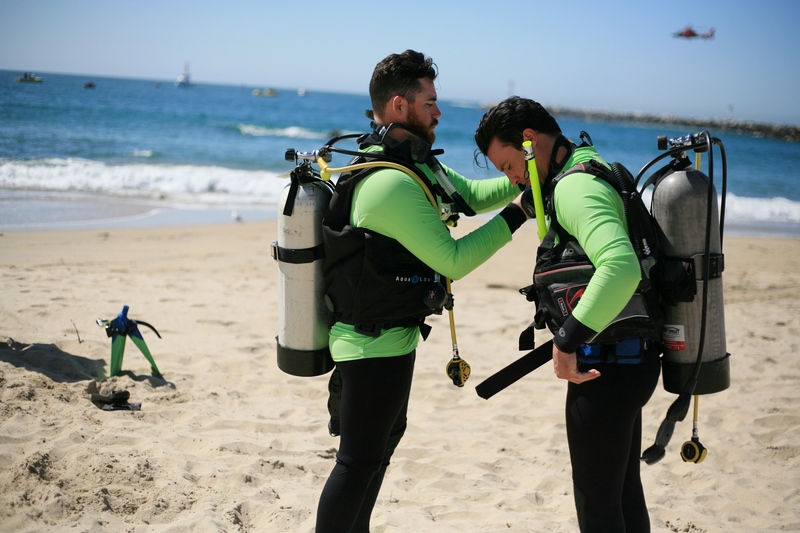 Lifeguard divers prepare to search the water for victims during the maritime disaster simulation on Wednesday. 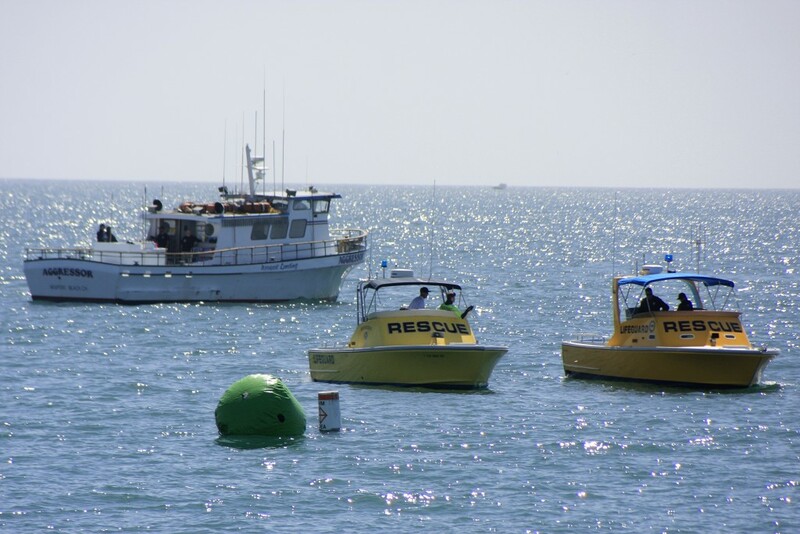 Lifeguard rescue boats search the water near the Aggressor, the vessel involved in the simulated boating accident. 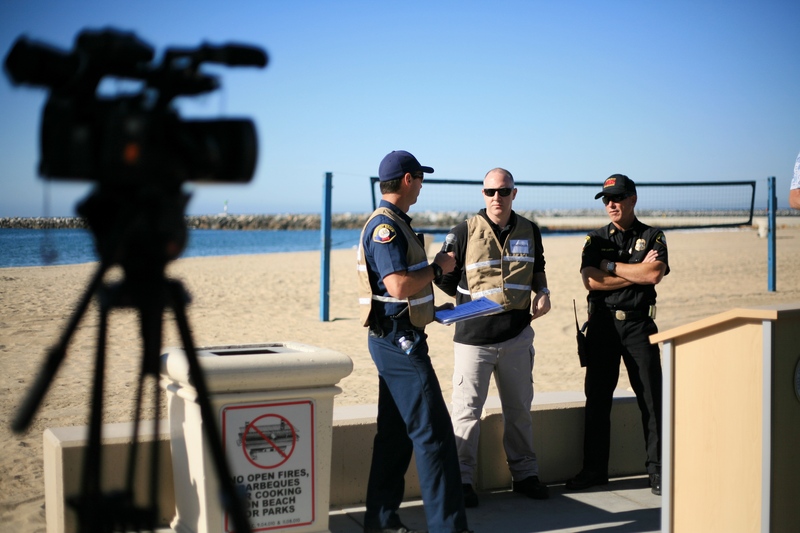 Officials prepare for a mock press conference during the maritime disaster exercise on Wednesday. 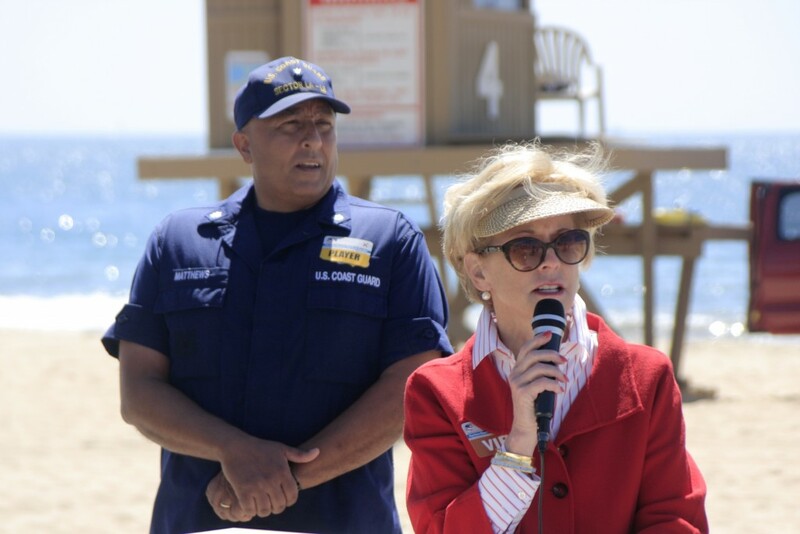 Newport Beach Mayor Diane Dixon makes a statement during a mock press conference. An Orange County Fire Authority helicopter pulls up a rescue worker and a “victim” during the drill. 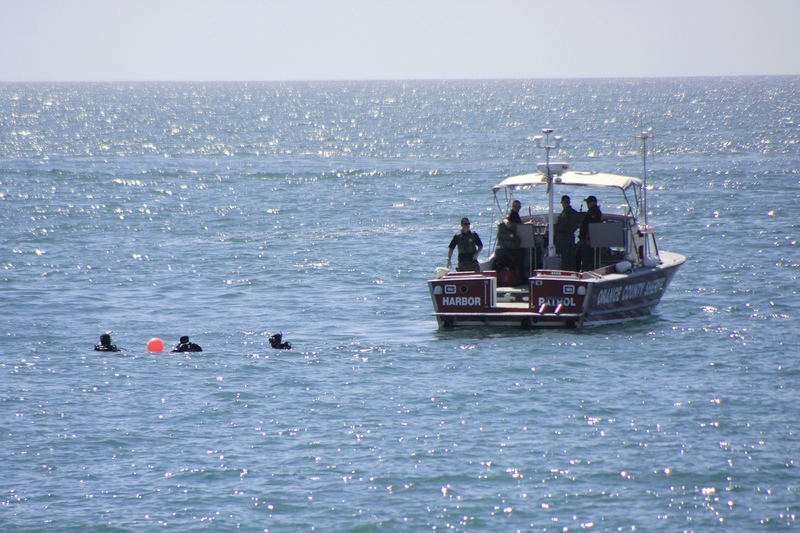 Divers search the water as an OC Harbor Patrol boat sits nearby during the maritime disaster exercise. 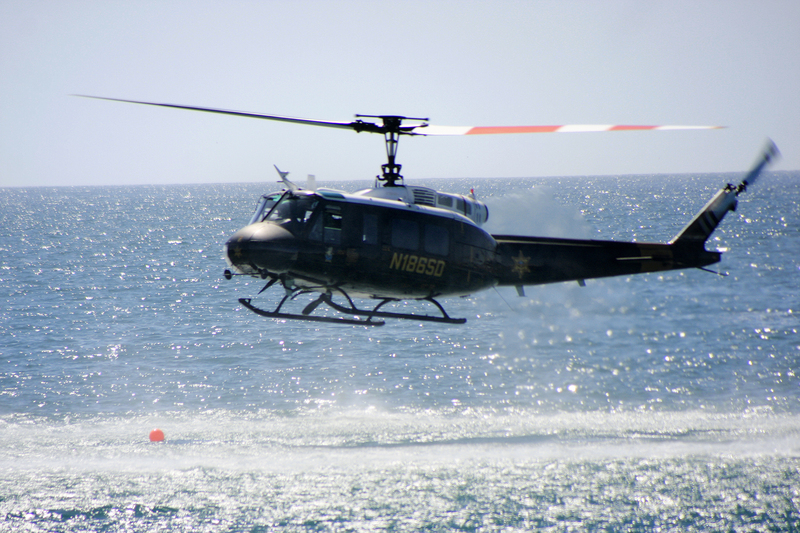 The Orange County Harbor Patrol helicopter hovers over the water during the disaster drill. Newport Beach Fire Department Assistant Chiefs Rob Williams (left) and Chip Duncan, who organized the maritime disaster exercise, talk to the participants as the drill winds down on Wednesday. 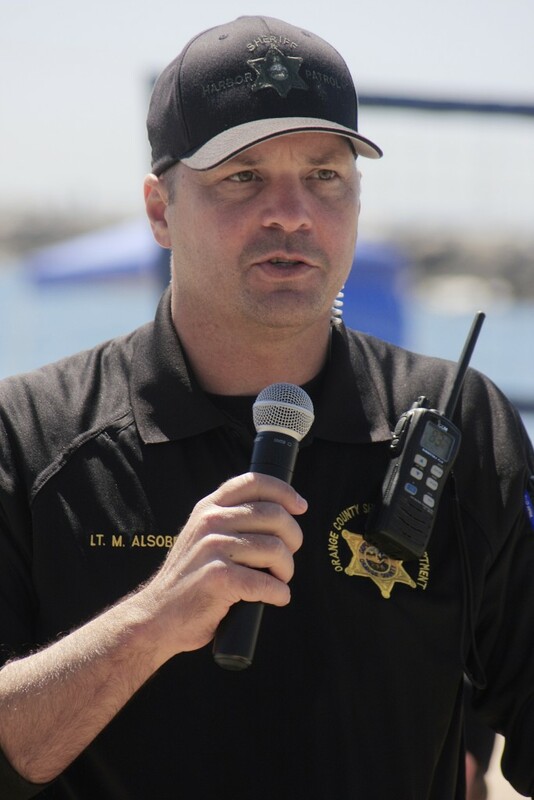 Orange County Sheriff’s Department Harbor Patrol Lt. Mark Alsobrook talks to the crowd during the hot wash, or debriefing discussion, as the drill winds down on Wednesday. Land, sea, and air-based rescue operations are in full swing for the multi-agency, full-scale maritime disaster exercise at Corona del Mar State Beach on Wednesday.